The new Fiat 500 Hatchback is compact, a piece of cake to drive and sports retro looks that have proven to be really popular with buyers. In fact, the car as a whole has been a smash hit on the city car scene. Its small dimensions mean it’s easy to park, while its mechanical bits are all bang up to date. However, question marks continue to loom over its safety and running costs. OSV takes a closer look at what it’s all about with our 2018 Fiat 500 Hatchback review. The Fiat 500’s natural habitat is the towns and cities, where its compact size and big windows ensure good visibility. The car skips through traffic with ease, and it can even fit through gaps that bigger superminis can’t. All models except the 105bhp TwinAir model come with the brand’s City Steering mode, which gives the steering a bit more power assistance. The result? You can twirl the steering around effortlessly, which makes parking even easier. If you want to make parking even more easier, rear parking sensors are optional for the Pop and Pop Star trims. The suspension setup is okay, although it’s a bit harsh. It smooths out most road surfaces but bigger potholes will present a problem. 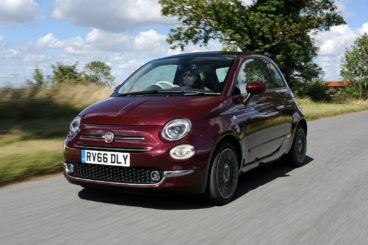 There’s lots of grip available, but overall the lack of feedback from the steering wheel and excess body roll mean that the Fiat 500 is never going to be the most entertaining car in this sector. In terms of its engines, there are no diesels available. The TwinAir two pot turbo petrol is our top pick if you’ll be spending the majority of your time in the city; at low speeds, it has a good amount of power, and it can get you from rest to 62mph in 10.0 seconds if you opt for the 105bhp variant. Go for the smaller 85bhp variant, and it will take you 11.0 seconds to cover the 0-62 sprint. Both variants emit a pleasant thrill that harks back to the 500 of the fifties, but not all buyers will enjoy the noise. There’s also a 1.2-litre petrol engine available, but because it isn’t as fun and takes 13.0 seconds to complete the 0-62 dash, it’s hard to recommend. The 500 sports a colourful, funky and contemporary interior. The soft seats are great to sit on, and if you avoid the entry-level models you’ll also get treated to two-tone upholstery. The Lounge model, meanwhile, adds a panoramic glass roof which floods the cabin with light. The logically arranged dashboard is pleasant to look at, but its gloss finish will scratch easily if you’re careless. The column stalks and steering wheel look lovely in their light cream colours, but the lighter colours are going to show up stains pretty easily. 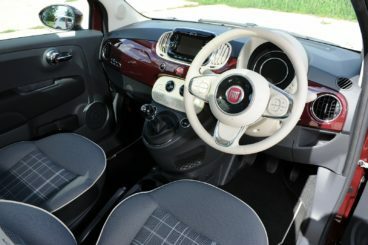 Fiat has made the steering wheel thinner this time, and there are lashings of chrome around the cabin, as well as more top-notch materials than last time. Fiat has also added their uConnect screen, which helps to keep the car up to date with its rivals. Is the Fiat 500 Hatchback practical? There’s no five-door model available, and this does restrict practicality a bit. Parking is easy, but accessing the rear seats is tricky. Fiat has tried to make things easier by installing wide opening doors and seats that slide forward. Only two adults or two kids can sit back there (there’s no third seatbelt), while cabin storage is poor. There is no glovebox, with Fiat replacing it with a tray, and the door bins are too shallow. The boot, meanwhile, measures 185-litre, which makes it one of the smallest in this class. Standard kit is good across most of the range but the entry-level Pop model is a bit basic. It misses out on the brand’s UConnect infotainment system (it costs £250 to add), but it does get steering-wheel-mounted controls and a radio. The Pop Star model also misses out on the UConnect system but gets 50:50 split folding rear seats, alloys, heated door mirrors and air conditioning. The Lounge model adds the UConnect system, front fog lights, rear parking sensors and a panoramic sunroof. Move up to the Mirror trim and you get a seven-inch uConnect screen and a seven-inch TFT instrument display. In terms of how safe the car is, the 500 used to enjoy a 5/5 Euro NCAP safety rating, but it scored just 3/5 when it was tested again last year. Alarmingly, it scored just 49% for child occupant protection. Its standard safety kit includes hill hold assistance, electronic stability management, seven airbags, and anti-lock brakes. Prices for the new car start out from £11,615 and rise to £15,265. To find out more about our leasing deals, you can check out our page here. In terms of its running costs, a small car like this is never going to be expensive to run. Sure enough, all the engines will fit into most peoples’ budgets. That said, the 1.2-litre 69bhp engine is a bit on the old side, and this counts against it on the economy front. It returns 60.1mpg at best. The 0.9-litre petrol engine is available in two separate power guises; the 85bhp variant can manage returns of 74.3mpg, while the bigger 105bhp variant can manage 67.3mpg. The 85bhp variant is the one to go for if you want a company car, as it has a BiK rating of just 17%. The 500 will always be trendy, no matter what era we’re in (it is, after all, based on the original car from the fifties). Its compact size, punchy engines and light steering make it a really entertaining little car. It’s perfect for anyone operating on a budget. The Pop model is a bit too sparsely equipped. Question marks often surround Fiat car’s reliability, and the 500 doesn’t escape them. Let’s see how the car fares against its rivals in the comparison section of our 2018 Fiat 500 Hatchback review. 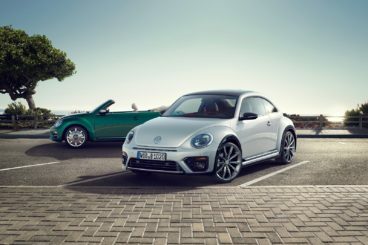 The new Volkswagen Beetle is just as retro-styled as the Fiat and offers good build quality and a set of economical engines. It is, however, tricky to park. On the road, the Beetle is predictable – something it gets from the VW Golf, the car on which it’s based. It’s neither massively exciting nor massively unexciting, and its precise steering proves to be helpful wherever you are. In terms of handling finesse, the Beetle has the Fiat beaten. Buyers can specify either a 6-speed manual transmission or a seven-speed automatic; we prefer the former, as the latter can be a bit hesitant at slower speeds. Overall, the Beetle is a fairly easy car to drive, but its curved shape is what can make it more difficult to park than the Fiat. Engine-wise, the Beetle offers both petrols and diesels. A 2.0-litre diesel engine is available in two guises, with a 108bhp variant completing the 0-62 dash in 11.0 seconds and a 148bhp variant completing the same sprint in 8.9s seconds. A 2.0-litre turbocharged engine spearheads the petrol range; it develops a healthy 218bhp and can whisk you away from a standstill to 62mph in just 6.8 seconds. Below that sit two smaller engines – a 1.2 and 1.4-litre petrol. Both are turbocharged and both offer brisk performance. Running costs? The 108bhp diesel engine is the most frugal with its returns of 65.6mpg, but the petrols are affordable to run, too. The 1.2-litre unit can return 52.3mpg on a good day, while the 1.4-litre unit is good for around 49mpg. Inside, the Beetle has been built to a high standard. The plastics are of a high quality, the controls are easy to use and insulation is good. The dashboard comes with a full-length body-coloured trim (like the Fiat), while a vertical glovebox is meant to be a nod to this car’s past. Is the Volkswagen Beetle practical? It’s a bit easier to live with than the Fiat but the rear seats are still on the small side. The car gets two glove boxes, some nicely-shaped door pockets and its controls and dials are all well-positioned. The sloping roofline limits rear headroom, while the lack of a five-door option means accessing the rear seats is tricky. The boot, meanwhile, measures 310-litres, which makes it a lot bigger than the Fiat. The new MINI Hatchback is efficient, powerful, stylishly retro and great fun to drive. MINI has made the new model more mature, but don’t let that worry you – it’s still as fun as ever. It’s just that MINI has also made it more refined and comfortable so that longer trips aren’t a pain. To this end, MINI have softened the car’s suspension setup and improved insulation. All models are capable of making you grin like a Cheshire Cat, and they’re all small, agile and lively. In terms of the engines, the entry-level petrol unit is a 1.5-litre three pot engine that develops 101bhp. There’s also a 134bhp variant of this engine available, while a 2.0-litre 189bhp four-pot petrol engine powers the Cooper S model. It’s nippy, sharp and can cover the 0-62 sprint in 6.8 seconds. Rounding off the petrol range is a John Cooper Works model that produces 228bhp and has a 0-62 time of around 6.6 seconds. Meanwhile, for diesel fans, there’s just one available. It’s a 1.5-litre engine that produces 115bhp, and which is going to be too noisy and coarse for many buyers. Like the John Cooper Works model, it comes paired up with a seven-speed automatic transmission, but it’s disappointing that it lacks shift paddles. Running costs? As unpopular as the diesel might prove to be, returns of a 72.4mpg economy are impressive. That said, MINI’s figures are optimistic, and you’ll probably average 65mpg. The petrols are impressive too, with the 1.5-litre engine able to return almost 58mpg on a good day. Inside, the MINI’S cabin has matured and looks better than ever before. It’s well-built, clean and tidy and logically arranged. The driver sits down low, the steering wheel, gear lever and pedals are all within easy reach, and the driver’s seat offers lots of adjustability. A massive central speedometer has now been replaced with a 6.5” infotainment screen which is surrounded by colour LED lights. It looks great. 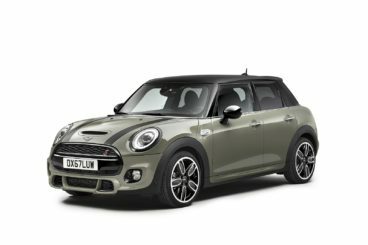 Is the MINI Hatchback practical? It’s more practical than last time but the same old bugbears remain – namely cramped rear seats and a small boot. This boot measures just 211-litres. That’s actually more than you get in the Fiat – but that isn’t saying a lot. Other than that, the car is easy to park, visibility is good, but accessing the rear seats is as awkward as sitting in them for long trips is. On a budget but want a stylish small car? The punchy 500 fits the bill. It’s held onto its retro look and its keen sense of fun, while its customisation options make it one of the most sought-after cars in this market. The Fiat 500 Hatchback won’t change your life, but it will make the trip to work so much better.